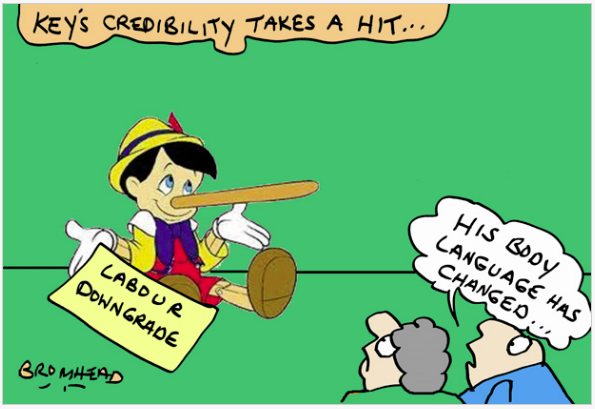 In an on-going series, we will look at the half-truths; mis-representations; omissions; and outright lies, told by Dear Leader John Key. The comment was made under Parliamentary privilege. His body language, tone of voice, and other minute clues all indicate he was being less than honest. I leave it to the reader to reach their own conclusion how honest Dear Leader was. In my opinion, John Key lied and the email was subsequently fabricated. So did a member of the public” phone Key and inform him that Peters had visited Kim Dotcom? Or did Key “read” about it somewhere? Which kind of makes Key’s earlier assertion that he “heard from an individual who’s a person who’s got nothing to do with National Party” a complete lie. As we all know, Slater is closely connecxted to the National Party; his father (John Slater) is an ex-President of the National Party; and Slater is probably a paid up member of the National Party. Unless it is Slater who is lying (which is equally plausible as he has a reputation for telling lies)? Otherwise, if Slater is telling the truth, then he has landed Key in it. Key had not been forthcoming either on the Standard and Poors “email” or on where he got the tip-off that Winston Peters had visited Kim Dotcom. What is equally disturbing is that Key is willing to use private information to smear a political opponant. Not since Paula Bennet released information on Natasha Fuller and Jennifer Johnston, has a politician willfully invaded another person’s privacy. Whatever one may think of Winston Peters – and I am no fan of his – Peters deserves his privacy like anyone else. This blogpost was first published on The Daily Blog on 17 February 2014. I take no satisfaction from Nick Smith’s resignation. Dear Leader will simply appoint another National MP to take Smith’s portfolios. Nothing has changed. In the scheme of things, his letter to ACC on behalf of former National Party activist and friend, Bronwyn Pullar, appears to be one of those gaffes that all politicians of species Homo Sapiens are capable of. That statement was the beginning of a political furore that, for the first time, attacked Key’s credibility. 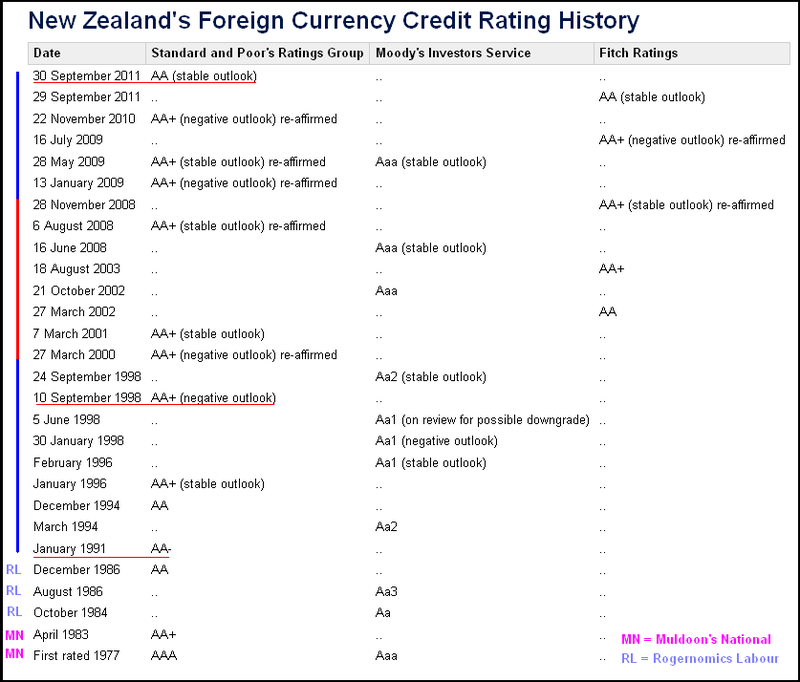 I was part of a session with a range of economists yesterday morning – every year they do this session – with economists from Aus plus all the main NZ banks, and this year two from Standard and Poors, including the guy who obviously has a lot to do with the NZ grading. Anyway, the S&P guys were very complimentary about how the NZ Govt is managing fiscally and their trust that what you say will happen happens, and your unwavering commitment to getting NZ’s balance sheet sorted for the long term. But there was a key one-liner that I thought you could well use. S&P said that there was a 1/3 chance that NZ would get downgraded and a 2/3 change it would not, and the inference was clear that it would be the other way around if Labour were in power. 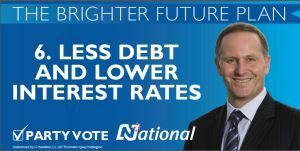 They discussed the impact on interest rates if NZ got downgraded and how that would quickly impact on the home owner mortgage market, so net net there is a much higher risk to NZers that they will face higher interest rates under a Labour Government. So, who was telling the truth? To this day, the identity of the mysterious author of that “email” has never been disclosed and we have no clue as to the veracity of who-said-what. Perhaps the wrong person resigned. From 2011 back to 1991? Many will recall that it was precisely brecause of severe cuts to state spending in 1991 that made New Zealand’s recession so much worse at the time. Ruth Richardson even boasted that her budget was the “Mother of All Budgets”. Economic data is presented here, in graph form, and shows the immediate conseqences that impacted on New Zealand soon after Richardson’s Budgetary cuts were implemented. 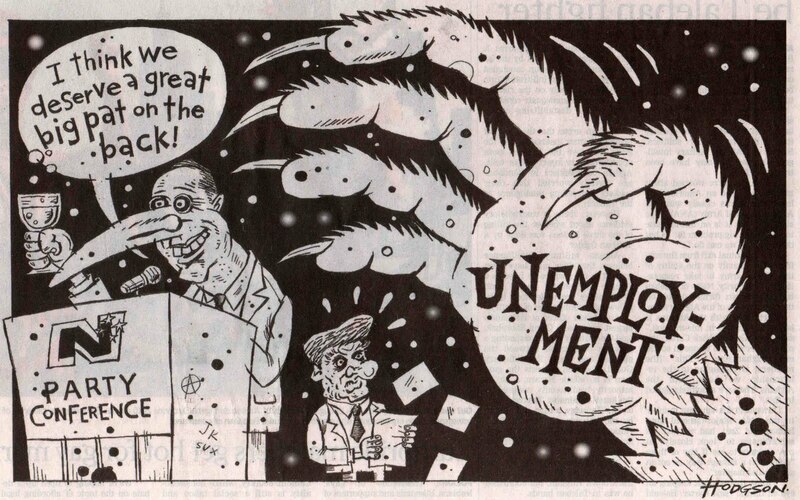 Unemployment skyrocketed to approximately 11% – the highest since Depression days in the 1930s. It is generally considered that Richardson’s harsh cuts unnecessarily deepened New Zealand’s recessionary effects. It caused considerable misery throughout the country as businesses collapsed; GDP fell; the prison population increased; and credit ratings agencies downgraded the country. And just to really drive home the fact that matters are becoming dire, ratings agency Standard & Poor’s today downgraded the credit ratings of our major banks; ANZ New Zealand, ASB, BNZ, and Westpac New Zealand,along with their Australian parents. Whilst it is abundantly obvious that we cannot influence events on the other side of the globe, and that the slow disintergration of the Eurozone; the economic downturn in China; and America’s mind-numbingly huge deficit – that our government can still play a role in what happens locally. John Key needs to read up on our recent history and learn from the mistakes of his predecessors, Jim Bolger and Ruth Richardson. He needs to understand that government cutbacks during a recession will not help – and will actually make matters much worse. Some high income earners, businesspeople, and free marketeers may squeal at the above suggestions – but we either pay to keep our economy afloat and maintain high employment – or we’ll pay for welfare, increased crime, social dislocation and other problems, as well more skilled Kiwis fleeing to Australia. Why not pay to achieve positive outcomes instead of the proverbial ambulance at the bottom of the cliff? Because either way, we will pay. Our recent double down-grade by Standard & Poors and Fitch will eventually flow into our mortgage rates. Bill English guesses that the amount could be “as little” as “about one-tenth of a per dent” – but of course, he’s guessing. This is borrowings made up, in part, because we could ill afford two tax cuts cuts which gave up to $1,000 a week for someone on a salary similar to John Key’s. In fact, National has cut taxes to such a level that they are now having to part-sell State assets to pay for day-to-day maintenance of schools, hospitals, etc. This is not good fiscal “housekeeping”. Put another way, it would be like a Courier selling his/her van, to buy groceries and pay other bills. The courier will have enough money – for a while. After that, the money runs out and the Courier is left with no money and no means to earn an income. This is not sustainable lontg-term. It is a desperate attempt for National to find money it does not have. Otherwise it will have to simply borrow more… or undo it’s 2009 and 2010 tax cuts. One wonders how National supporters in Epsom must be feeling. The leader of their Party hints that they should vote for ACT’s John Banks, whilst Key himself votes for the National candidate, Paul Goldsmith? In effect, National’s electorate candidate is not really campaigning to win. And if he doesn’t want to win, why is he standing? 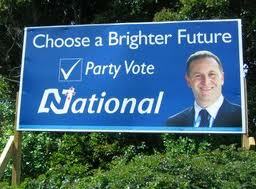 To give Epsom National supporters a “wink and a nod” to Electorate Vote ACT and Party Vote National? And if such is the case – what possible legitimacy does that give ACT when they can’t attract electorate support on their own merits? So much for ACT being a Party that encourages success through merit. Especially when they apply the merit-based principle to Maori: Maori Must Earn Auckland Seats On Merit . ACT and National’s machinations in Epsom are, of course, due to ACT’s low poll ratings. Practically every single poll has them around the 1.5-3.5% mark. Under MMPs rules, if they cannot cross the magical 5% Party Vote threshold – or – win an Electorate Seat, they will end up like The Alliance and NZ First: out of Parliament. Horizon is the only polling company publishing results for don’t know voters. National has highest voter loyalty: 76.2% of its 2008 voters still support it. It has picked up 19.9% of Act voters and 9.1% of Labour voters (while Labour has picked up 7.6% of National’s). 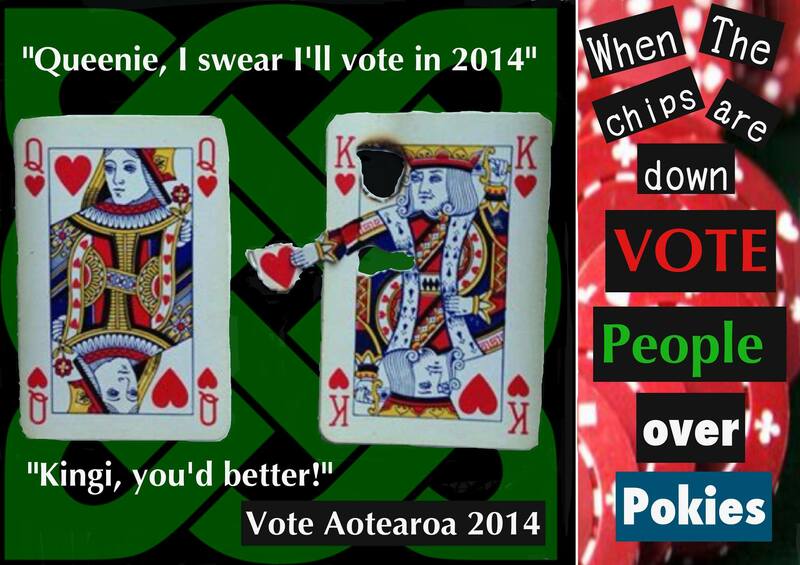 The Greens have 68.7% voter loyalty and are gaining 2008 voters from the Maori Party (23.1%) and Labour (14.6%). Labour has 63% voter loyalty, losing 14.3% to the Greens, 9.1% to National and 3.7% to New Zealand First. The Maori Party has 30.8% voter loyalty, losing 23.1% of its 2008 voters to the Greens and 19.1% to Mana. Horizon Research says a great deal depends on the support New Zealand First attracts at November 26. Horizon polls have had the party at 6% or higher since November 2010. (Note the poll’s margin of error is +/- 2.2%). If correct, National is in trouble. Their chances of a second term are not guaranteed, and judging by the public’s low opinion of National’s performance of the grounding of the m.v. 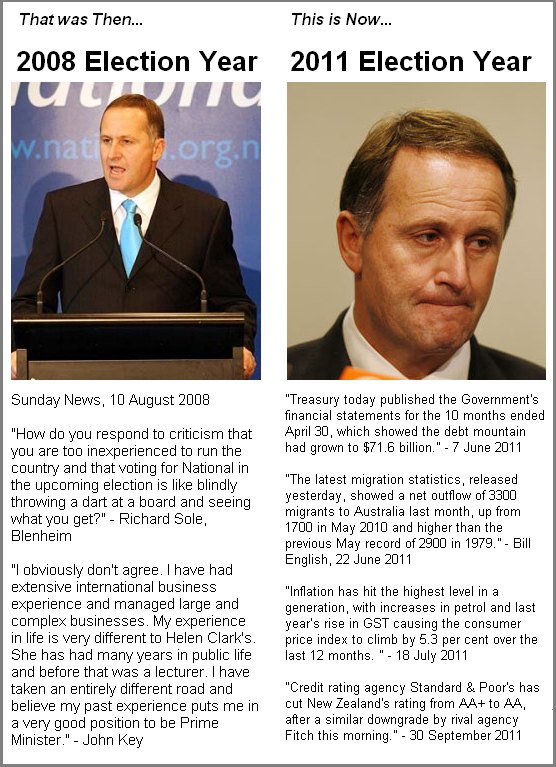 Rena; the double credit-rating downgrades; the questionable veracity of the so-called Standard & Poors “email”; and various promises made that have not been kept, John Key’s “teflon” image is definitely beginning to show signs of wear and tear. And with the RWC behind us, and the public “partyed-out”, a return to politicking may be a welcomed diversion for many. Especially as people begin to focus on issues such as asset sales and the sales of farmland – both contentious and highly unpopular with the public. In a way, the RWC may even strengthen opposition to asset/farm sales to foreigners. After all, if we’re good enough to beat the world in rugby, then why the dickens aren’t we good enough to hold on to our taongas?! Explain that, Dear Leader!! On the other hand, though Labour leader Phil Goff has consistently polled lower than Key, his dogged determination to persevere and not fold under media scrutiny may actually earn him “brownie points” with the public. Goff can wear the label of “underdog” with real credibility. If Labour can play on this in a subtle manner, and show that Goff does not cave under pressure; that he keeps on like the proverbial ‘Energizer Bunny’ when all seems lost; and that he doesn’t rely on shallow charisma and meaningless smiles and utterances – he is in with a fighting chance. God knows that lesser mortals would’ve probably chucked it in long before now, and call for a replacement from the “benches”. Taken in isolation, the grounding and response from government and statutory bodies would probably have raised no more than slight annoyance from the public. But the grounding of the Rena is now the third major disaster this country has experienced; on top of the Pike River Mine explosions and the Christchurch earthquakes. In both instances, central government made promises to locals that – in hindsight – may have been unrealistic at best, and irresponsible at worst. Public patience with the ever-smiling, waving, John Key may be wearing just a bit thin. Then on top of all that, was the near-disaster of the Rugby World Cup’s opening night. The government had well and truly taken their collective eyes of the ball that night, and it is pure good luck that no one was seriously injured or killed in the mayhem. Unrealistic promises and slow responses were only the beginning. Now let’s really stir the political pot of discontent; our youth seem to have re-discovered their own political power and realised that leaving matters to the Older Generation (us) may not achieve the outcomes they desire. God knows our generation has succeeded in wrecking the global economy; threatening the stability of the Eurozone; and bringing the once great super power that is the United States, to it’s knees. The recent government interference in Student Union affairs (forcing voluntary unionism upon people who may not necessarily wish for it) should be a stark wake-up call to young people that National governments – far from being “hands off” and opposed to “nanny statish” behaviour – can be just as controlling as their counterparts allegedly were. In fact, more so. After all, this “hands off” government did force almalgation on Aucklanders without any democratic referendum being conducted. National had no hesitation in passing legislation to ban cellphone usage whilst driving (but not banning applying makeup or eating whilst driving). Then they lifted the driving age. And have begun liquor law reforms. And John Key is even now contemplating the ungodly “Nanny Statish” policy of making Kiwisaver compulsory!! Oh dear gods – whatever next?! All in all, the gloss has worn away from this government, and it’s track record of the last three years cannot be dismissed with a smile and a wave, with a hollow promise chucked in for good measure. And young New Zealanders are starting to flex their political muscle. Not too bad, on top of winning the rugby world cup, eh?